I have decided to try to take back my occasional participation in the lefty AGORAVOX forum (sticker to my posts there on the right side of this page). So if at least a couple of you were kind enough to register at Agoravox and leave a friendly note... I get there the nastiest beatings, but their silliness makes them rather quite amusing although my poor Mother is horrified. English language PSF are not only in general better behaved but they do write better arguments even though most of the time unsustainable. Then again limiting their posting by refusing the usage name calling and insults does help, does it not? :) At my recent Agoravox article name calling and discrediting the article for even a simple orthographical error is the norm. but that is OK, I have survived enough PSF onslaught to let it slip by unheard. This is a little mindmap representing some of the top guys around Hugo of Sabaneta, a few details about them and some relationships they have with some figures. Vicente is too old to become too much of a public figure or a possible successor to Hugo, but he still pulls a lot of political and economic strings. Diosdado is, apart from Hugo, the most agressive, even if Aristóbulo is becoming more so. Aristóbulo seems like the "less unkosher" of them all (the one with less links to the wealthiest), as far as I know. He was an active politician of the IV Republic, though. If you have more details, please, let me know, preferably with references. Here the first update of the poll about when readers think Hugo will cease to be Venezuela's head of state. This is far from scientific and there may be readers who tip on what they think and others on what they want. Still, I think we can get something interesting out of this. There were more readers answering this time. I am curious about how numbers will develop this month. So, please, readers: when you are ready, just give your gut feeling about how long you think the Líder Supremo will be president of the country. How many forms of torture can you count on this picture that is hitting the stands this morning in El Universal? I count at least three: the fingers in the eyes, the breaking wrist and the humiliation of having to hold tight to your own clothes. And who knows how many others we can count, starting with the image of this armored cops and whatever they did to this kid. Amnesty International is taking notice. The numbers of government expressing their concern keeps growing. More images right now and for a few days in the photo gallery of the English section of El Universal. Look on the lower right side, no links, it is java. There you have it, the lovely bolivarian revolution has reached midnight and the ugly terror and repression filled fascist pumpkin is coming back to life. Note on further censorship: the bolivarian revolution has absolutely no sense of humor. Even imagining as a joke what would a post Chavez era be, gets you a stinging communique from Propaganda Ministry. the Tal Cual humor editorial of Laureano Marquez this Friday, translated at Miguel's blog, will be used to prosecute him and Tal Cual because according to the women in charge of Chavez "communication", Blanca Eekhout, Elena Salcedo, and Vanessa Davies, it is an open appeal at insurrection. Vanessa, que tan bajo has caido......... Las otras no tienen vida, pero tu, tu no deberias meterte en esto. Das pena ajena! iPad perfect for reading news about Venezuela! I have grown hoarse from the many times that I tried to explain people that Chavez and his movement are a reactionary movement, whose only model is the caudillos that bled the country to death in the XIX century. Well, the picture below will explain it better than the gazillions words I used. This is the latest tool used by Venezuela's Nazional Guard to repress the student movment this week. Human Rights Organizations of the world, please? I’m not a student anymore. I’m 25 and I finally got my degree last year. I’m too old to be part of it and seeing pictures like this one, taken a couple of hours ago in my city, makes me feel a bit nostalgic. I’m glad that what it started in 2007, when I was still a student and fully a part of the movement, still remains, and it has improved ever since. I’m glad to see new generations fighting for the same ideal, approaching to it even with the new difficulties and in new ways. To protest in Venezuela is now harder than ever. When I started going to protests, back in 2002, a detention was something unthinkable. They started to become something normal, if I remember correctly, in 2007. Now, is weird to look at the balance of a student protest without at least ten students spending a few hours or more behind bars. Repression has always been something “normal” to expect when you are at a demonstration. 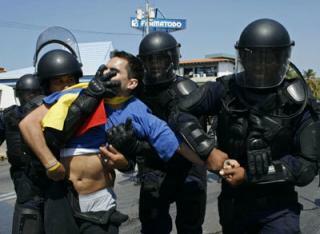 As years pass by, the repression has become more violent and more severe. Students need to perform some activities in secret to avoid the encounter with the police forces as much as possible. The route of the student’ demonstrations is kept in secret until the morning of the protest, when they are announced in student’ assemblies on every university of Caracas. The final point, the goal of the march is not revealed until the crowd is obviously approaching that spot. The communication is done via Twitter or text messaging. With all that under consideration, this picture is a miracle. And every person in it, every little dot, has my deepest respect. Euromonitor found out, as Venezuelan newspaper El Universal reported, that our nation is one of the top 10 weightiest countries on Earth - hipwise, that is. Around 29.6% of Venezuelans are obese. The percentage of belt-challenging people among Mexicans is just a little bit higher, but just a bit. Guatemalans follow suit. Venezuelans are really putting up on more than one front. This is making the country even more inefficient and it is becoming an extra burden for our health costs. Unlike what the regime says, this does not have to do with improved diets and more food for the poor. It is a complex issue but it has a lot to do with more fast food because of lack of time, a more difficult environment in which to do some exercise and the loss of culinary traditions. It also has to do with an education system that is not delivering on practical education about health issues. I don't think a president - or a future prime minister when we have one - should be talking about people's body weight as Hugo did. That is not her business. I do think the education and the health ministries can do something about this issue. The basic thing is to inform people. Venezuela's government needs to work in particular on improving security, which has deteriorated dramatically in the last eleven years. Security is affecting all the rest. The government should introduce fast lanes for buses as in Europe. This is an idea the opposition government in Miranda was trying to implement in their area, but the regime opposed, even if people supported the plan, just because it was the opposition's idea. Obesity is like a contagious disease, it spreads and spreads faster all the time. Last time I was in Venezuela with my family I was looking at some old pictures of my parents, aunts and uncles. There were some where they were all on the beach. A cousin of mine made this comment: "cónchale, they all looked so fit and we at the same age now look like real Potamitos". It was so very true! Take a relative of mine: he spends hours and hours on the horrible jams of Venezuela (NY traffic? that is peanuts). He arrives very late at night. He lives in a working class area. When I was a child I used to walk with my parents in the evening along those streets. Last time I did it some years ago, just in the early afternoon, a gang wanted to rob me. I was just lucky they did not have a gun. My relative could only do sports at home or at a gym, which is an expensive, very time-demanding endeavor in Venezuela. He can also use part of the weekend, but that is not enough, specially if you need to build up a habit and again, sunset limits the time he can be walking outside. So: security will have to play a big role in improving health in Venezuela even in this context. It really does not matter whether the president is a Republican or a Democrat, I am always fascinated by the late January ritual in Washington, the State of the Union. Obama first real one fulfills my simplistic expectations of a brief love feast between irreconcilable enemies. All the usual cliches and paraphernalia are present, but this year I was sensitive to two in particular. Obama was received warmly by the Republican appointed Chief Justice. I know, I know, they all play their part but yet there seems to be enough sincerity and respect between the two guys to make that moment, shall I dare say it?, institutional. The other thing that hit more than usual is that no one besides the army chiefs wore medals. That republican simplicity where many a Senator is different from the President just because he may be wearing a better tailored suit. Of course I am just a Venezuelan where today such a spectacle is simply unthinkable. When my president gives his state of the union speech, he arrives with all sorts of medals and ribbons on his chest. The other powers of the state seat on his side and look subdued enough in a silly pretense of equality that fools no one. In America the Speaker watches from above and the Chief Justice observes from below. The symbol is not lost, no matter what party holds which spot. In America Congress applauds or only one aisle. On occasion the other aisle may groan some, but the President makes his speech. In America the President is the center of attention but the other attendants are not mere stone guests. In Venezuela it is all about my president. In the United States of America all is there to try to avoid the president becoming the bloated howling monkey that mine has become. [Updated] I have been receiving phone calls with all sorts of concerns, people afraid that Chavez is preparing some undercover action, stirring deliberately the current protest for some evil purpose. Maybe, but it seems that the genie is escaping the bottle. The fact of the matter is that chavismo once again lighted the fuse that could mark its undoing, just as it lighted it in 2007 to lose the December vote on the constitutional reform. This time the stakes are higher: the National Assembly vote of September. He starts with a serious handicap. In 2007 he was fresh from his reelection large victory and yet he lost the vote one year later. Now he starts with high inflation, increasing unemployment, less money to buy votes, a brutal devaluation which inflationary effects will be felt before September, lower poll number, a recession that is one the verge of becoming a depression once we consider the electric power crisis. Just for a short list of ills. And then he decides to close RCTV, on cable only, out of sheer ego! Out of a vendetta against Marcel Granier! 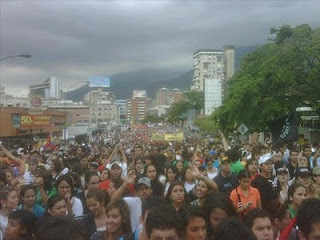 As a result students are again in the streets, but this time around in many major cities of Venezuela at the same time! In 2007 it started in Caracas ad slowly propagated. His international image has been hit much worse than in 2007 when he still managed a fat check book. Now even the French are bitching at Chavez. They have lost many contracts to very inferior competitors due to bribe schemes (I have been told by very reliable sources that shall remain nameless). And Chavez takes away the EXITO retail chain! Without any real reason besides disposing of space for his latest distribution scheme of COMERSO which is doomed to fail just as Mercal and PDVAL did. It is indeed easier to steal what is already built than to create a brand new structure, a normal reasoning in a government of thugs. All of the current mood is quite well summarized in today's Washington Post editorial. But it is on the mundane we best see the disarray of chavismo and its inability to comprehend what is going on. Yesterday for example I was mentioning the words of Merida 's governor, an irrelevant rambling betraying his incapacity to understand, at coping with the situation besides gun shots, tear gas and murder. Or we can look at the pathetic display of the chavista "student" movement leadership which after three years is still only able to present the same few characters like Robert Serra, long graduated, ensconced in some cushy government or governmental associated sinecure. Goicochea and his 2007 combo are not seen in the streets, or are not at the front anyway, having made good with their gifts at getting real political jobs. It is not that there are no students that are chavista, it is that either they are not that good at leadership, or that chavismo at all level suffers already that terminal diseases of political movements, not to let new blood emerge. Another good example of the chavismo brain washing that blocks them from adapting to new realities can be found in yesterday VTV visit who forced the state propaganda machinery to give them a few minutes of air time. When they left a near hysterical VTV journalist was asking them if they were going to go to Globovision to demand the same thing! I could not believe her! You can hear part of her insistence at around 35seconds of the video that accompanies the preceding link. Truly the poor woman does not watch Globovion ever, which is routinely complaining that government officials refuse to visit their talk shows. Had she watched Globovision she would know that the student leaders visit quite often and need not put any pressure to have their existence acknowledged. I could keep going giving more examples of the fairness of Globovision compared to the propaganda of VTV, but I just need to mention Chavez cadena that repair any "imbalance" that any network would have. No, the issue here is that the VTV journalist not only espouses the official line as her job requires, but she actually believes it in her heart, bait, hook and sink. She has lost the man attribute of any serious journalist: a minimum of critical and inquisitive spirit. As such she was shocked at the VTV visit and had to express that unseeingly aggressive questioning you can see on the video. But the best example that chavismo is out of base on this one comes from Chavez himself, condemning the twittering typists of terrorism (hoping not to date myself to much with this paraphrasing, a bonus point for whomever detects it first.). In a display of how archaic is his thought process he could not hide his distrust for new technologies that allow people to escape from his reactionary thought-orders. Thus, as his good Iranian friends, he called twitter a terrorist weapon. Indeed, though twitter yesterday the students showed him how to escape his goons and reach the doors of VTV in a great political stunt. But Chavez ridicule does not stop some of his acolytes who know better to try to invade the twitter world. Are they going to be terrorists too? I reread this piece and I realized that there was something missing to make my point clearer, to tie up better the whole post. I am not ruling out that Chavez indeed took the crazy step of shutting down RCTV to bring the students back in the streets and create a crisis that would justify some harsh reaction. After all, he has not been afraid, and admitted to create the 2002 crisis, to ruin PDVSA as long as any cash it got was sent his way for discretionary spending. Once you have played with the future of a whole nation, what are a few cadavers along the way? The mental state of Chavez today is comparable to the one of Hitler in the movie "The Fall", a guy that is not afraid to bring whatever havoc it takes to remain "in control" even as control is escaping his hands. As a skilled politician with enabling doctors/pushers he can put a front; but that is what is going on, a bunker mentality that is setting up at Miraflores Palace. Naming Elias Jaua as vice President, a radical that refuses to discuss with the "enemy", of proven ability to destroy the opponent by ruining them first and threatening them if needed, proves that point. That Chavez succeeds, that he controls the situation to reach only the necessary violence for the excuse he seeks is possible, but I doubt it. Mad rabid dogs may look as if they have a strategy, but the end is always the same. The only difference is the body count. Last night, I was talking to my boyfriend about how much I love blogging. “Could I get paid for blogging? And blog as a full time job?” – I naively asked him. I know they are some people, who earn money thanks to their blog, but I’m not familiar with the ways and I’m not comfortable about using publicity that it might distract the readers. But putting that aside, Blogging about this, about anything else; would be like my ideal job. To engage with a story or a feeling, to carefully – or not – prepare an entry on a Word Document, to copy it and paste it in a blogger entry template, adding some necessary html codes, to carefully –if needed – select an image, to click on publish and wait for the comments; to delight yourself when the comments reach – if they do, unfortunately they not always do – or when your visits increase. To create your own space that anyone, everywhere, can see and read and make a stance about it. In Venezuela, Internet is our best source of information. Of all Internet sources, including Blogs; Twitter and Facebook have proved to be more effective because of their ability to transmit the information shortly and immediately. For the rest, the traditional media is pretty much banned for us. There is only one channel with an open TV signal who dares to pass on information and commentary against the government: Globovision. But this Channel is forced to follow many government regulations which include to broadcast long “cadenas” of government’ propaganda, speeches and event; and to not inform about certain news (especially does about violent events and street protest) immediately because, government argues, this would multiply the protests thus creating a chaos 1989 like. Plus, the channel doesn’t have the necessary equipment to broadcast live sometimes. On cable we had RCTV but RCTV is not a 24 hours news channel, like Globo has many troubles to broadcast live and, hey! It was closed by the government – again – last Saturday. The government designed what we call the “RCTV law” which established that if the production of a cable channel was made in Venezuela in a percentage equal or above 70%, this Channel would had to enter the same regulations as open signal TV channels, including the broadcast for hours of government’ propaganda for free. Plus, this “national cable channels” would not be allowed to interrupt any program to broadcast any publicity. Virtually, the only channel that fell into this regulation was RCTV. 4 other Channels also got the same luck, one from Chile, but I have never seen those to be honest – and I have cable. RCTV claimed the measure was illegal, refused to broadcast a few “cadenas” and argued that the publicity issue would kill its finances. Soon before we know it, RCTV screen was black again, giving us an odd memory back in 2007 when RCTV was the oldest open signal Venezuelan channel and the government closed it at midnight, thus forcing it to move to cable. The radio used to be an excellent source of information. In my family it was mandatory to carry a small radio to the marches and demonstrations because thanks to the radio we could follow the route of the march, to be informed about how massive it really was, what effect it was having and over all, beware of any troubles. The radio was my boyfriend’ faithful company every afternoon, stuck in traffic, on his way back home from work. Sometimes, he called me from his cell phone to tell me about some news he just had heard. But those kinds of calls stopped a few months ago when the government decided to massively order the closure of about 30 radio stations. Since then, the radio is about 90% silent. You can roll and roll throughout the whole FM frequency without finding any dissident voice. Most of the few radio announcers, who didn’t lose their jobs, are now practicing self- censorship, fearing they would follow their colleagues luck. Others still hardly criticize the government, but this last, maximum, two or three hours a day. As you can expect, in the frequencies that belonged to the closed radio station, now you can hear many pro- government voices. Lately, I have heard the weirdest Revolutionary programs, including one about “the Socialist Philology”, hosted by some Argentinean who didn’t seem to have a clue of what he was talking about. The rest reminds me a bit of Orwell’s 1984 (one of my favorite books, in case you haven’t noticed yet); the simple and repeating songs that the “prole” (the poor ones without any class conscience or hope to have one) happily sang, feeling that everything was ok: on Venezuelan radio now there’s a lot of music everyday. Less than a year ago, at some peak hours it was hard to find any music on the radio. The stations were filled with commentary, debates, news, talks, calls… Now I regret every time I complained because sometimes I just wanted to listen a song and I couldn’t find any between all those radio talks. Now I can have all the music I want, but not a single opinion. As for the press, is still there to some extent. But to be honest, I don’t like most of the Venezuelan press, I think is poor and incomplete. The papers usually spend a lot of space with big, useless pictures that accompany articles or news that do not need pictures in the first place. Those pictures are followed by a small, narrow, synthesized text, which always leaves you wanting more. You buy a 60 pages newspaper feeling that you waste your money if you judge by 55 pages of it. Even if the press were good enough, the press can only give us delayed information: on the afternoon or at the next day. In this fast moving world, printed press is usually delayed. We need to know if a few blocks away from home, the police are throwing tear gas bombs, or if there are wounded in a protest at one university because a relative is studying there and cell phones usually collapse on those kind of times. So, logically, we have Internet. Thank God for Internet. Thank God for Blogging. Thanks, even more, for Facebook and Twitter. Thanks for giving us the opportunity of reading something more elaborated or worthy than what we find in the press, in the comfortable format of Blogspot, Live Journal or any other. Thanks for allowing comments and forums on nationally known citizen’ journalism pages such as www.noticierodigital.com and www.noticias24.com. Sometimes the information those pages contained is not well written or is not totally inaccurate, but is totally free of any type of censorship (including the most dangerous one: self censorship) and their discussions are music to my ears, the necessary catharsis for the appealed Venezuelan’ citizen. Thanks for those status on Facebook on which we laugh, or cry, or inform about those things we used to hear on the radio and now we can’t. And every since this week, that I have just discover (late, I know, but I did) its true potential, thanks for Twitter. Same as I love blogging, I’m finding out that I also love Twittering. I opened my Twitter account a few months ago with the sole propose of informing my readers every time I publish something new, here or at my Spanish “light” blog. But since RCTV – second closure – happened, and painful events at my university and in many other places erupted, Twittering became almost as important as breathing. If it wasn’t for those 140 characters messages in my screen; it would have take me hours to find out that my university was a battle field since the police started to repress a demonstration, that protest against RCTV closure had erupt from Merida till Puerto La Cruz and that the “cacerolazo” in my neighborhood was not the only one. 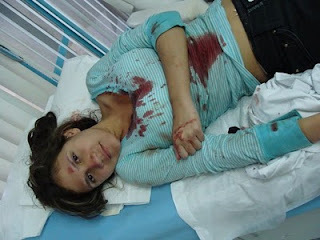 I knew that two students had died in Merida long before Globo or any other news agency dared to say something about it. And I had the plus to find it out directly from witness, who shared pictures and thoughts, who begged that the vital info they were passing on could be Twitted and re- Twitted all over the screens of this country. Internet 2.0 – Blogging, Twittering, Facebooking – is the only effective, immediately, massive way Venezuelans have now to be informed when we need to know. Is that part of us, the scream, and the anxiety which used to be broadcasted live on several TV channels and now has gone. Now, that we cannot recognize ourselves in the TV or radio, that the TV and the radio are merely arms of the government and not tools for the citizens, we are rebuilding ourselves throughout Internet. In a place where no street is safe, no entertainment place can be frequently afforded, no government institution or program seem to give us any benefit unless we “prove” to be “revolutionary”… Internet is a beautiful alternative. Internet is young, fresh, easy, fast; but most important, is ours. We have lose the power of even whispering outside unless we are up for huge police reprisal, but by hitting the keyboards we can scream just so hard that it seems uncanny. In a country where nothing belongs to us, Internet is ours. And that’s one wonderful, incredible, challenging power. Whatever it is to speak about politics or this new movie we love or not, we have this one space to be ourselves. “But in the end, besides feeling the threat from a weapon Chavez does not control or understand totally, maybe his key problem is that he could never make adequate use of it. For a man accustomed to uninterrupted speeches of six to eight hours, it must be simply impossible to even consider the possibility of communicating anything in 140 characters”.- So true! I woke this morning with the news of the deliberate assassination (?) of a Merida student by a pro Chavez Tupamaro group. Now every side is happy, they all have their martyr. On TV the tension is mounting about today possible events. Cops everywhere in Plaza Venezuela but the students are too fast for them. I heard the radio interview of the rojo-rojito governor of Merida state. His speech, aimless was sustained with he usual banalities of chavismo: "apegado a la constitucion" "el 11 de abril" "la revolucion" "deestabilizador"and such platitudes that could not hide his disarray, his inability to understand what is really going. His long rambling is summarized quite shortly and completely by Globovision. This is the sense we have from the regime: although they seemed to have looked forward a reaction (Globovison this morning was showing a full video of Lina Ron with a militarized brigade of her followers all with red shirts and flags, deliciously fascist in design) they never expected such a strong one and besides shooting they have no idea what to do. To tell you how fast the international reaction was, Index on censorship, the English quarterly monitoring world censorship asked me for an article fast which is already up and front page. Please visit and try to leave a comment. Their editor is not only good but fast and in a hurry. The interest outside is quite simple to understand: in the civilized world NOBODY can understand why a government would go out of its way to design a new rules system uniquely to shut down a specific TV station on cable TV only (even if as an excuse a couple of other channels fall with the flack). However they all undertand one thing: it is purely a Chavez whim, but an unacceptable one. we are seeing only the early part of that: consequences will be worse than three years ago, bringing among other things a renewed interest from the rest of the world about the coming Venezuelan elections. Will the opposition play its cards right? Chavez must be livid tonight. Or perhaps ecstatic. With bi-polar personalities one never knows. The hurried up second closing of RCTV Saturday at midnight has provoked a major reaction in the country. Between Sunday and today all the usual suspects gave their condemnation to yet another arbitrary and, let's not be afraid of words, dictatorial measure. But the most unexpected reaction came form the student movement who rioted (after provocation from the police in most instances) in Caracas, in Valencia, in Merida and in Zulia (and other places to a lesser extent). Harsh repression took place. Eventually seven students were injured and one killed. And it will not stop as already the student movement has called for more actions for tomorrow. In a moment of stunning candor the inept interior minister Tareck el Aissami noted in his usual "the Empire from the North is behind everything" speech that there was no noted political figure behind the student near uprising. In other words, the government is absolutely unable to note the spontaneity of the protest due to such an unfair action as closing RCTV as we in the opposition know full well that even if the leadership wanted such a day it could not do it as fast and as complete. Unbelievable to be so out of touch! But the overseas front was not any better for Chavez, the US and the French government, recently battered by the idiotic Haiti accusations and the takeover of French EXITO, expressed fast their concern over freedom of expression in Venezuela. In the press things were hardly better, a press system reacting this time around much faster than it did in 2007 for the first closing of RCTV. The press went as far as writing articles on the now obvious rotting out of the Chavez regime, such as this piece at the WaPo from Jackson Diehl who obviously reads at least Miguel's blog. And never mind that Insulza sensing that Chavez support might not be enough to ensure his OAS secretary reelection chimed in offering to come himself to mediate! Some people really have no shame! To finish the day a major cabinet reshuffling as nothing less than the Vice President (and his wife, the Environment minister) resigned "for personal reasons" taking along the CEO of the recently nationalized Banco de Venezuela. Speculations go from chavismo nasty infighting, to corruption charges to, gasp!, disagreement with recent Chavez policies. Clearly, the situation is degrading fast, perhaps faster than anyone expected. The regime is in crisis and Chavez ability to control the situation can be seriously questioned. Then again it is possible that Chavez is provoking the situation as he knows that the in the straight way he is toast any time soon. So maybe tonight he is exulting, thinking about the civil war he is about to start. Ps: other notes added after publication of this post. TV is calling for calm and quiet. Major league baseball (of Venezuela) begs to stop poltical demosnterations at our local World Series between Caracas and Valencia (they are afraid that the president will be too upset and take revenge on seeing that a very large majority of the stadium is booing him!). I observed on TV the pro Chavez "students" who came out in Caracas to try to counter the protest in front of CONATEL (with Lina Ron who is now out directing her red shirts instead of attending her trial!). Since the 2007 student movement started we are now seeing THE THIRD GENERATION of student leaders taking the front line. Chavismo still has the very same spokes-students it had in 2007, all of them identified as also being public employees.... and accompanied by fewer people than the opposition movement. By the way, these people accompanying these pro-Chavez students look more like the red shirt goons of Lina Ron than the "bolivarian" students I see at the UNEFA. I do not know about you, but for me this is the best evidence of how exhausted, and desperate, chavismo is becoming. A great image gallery from Globovision. It includes a pic of Lina Ron and her lined up red shirts. It has never happen before. The students at UCAB (a private Catholic university) have protested many times before against many government measures. Today was different. The police, for unknown reasons, entered the campus trowing tear gas bombs and pellets in places like the cafeteria. Some students are injured, still don't know how many but someone just sent me the picture of one of them. I can confirm 100% that this photo was taken at UCAB. I recognize the curtains in the left from my visits when I was a student like her. Only difference is that I visited that infirmary because of a headache or a period pain. Not because of a crash with the police. It is painful to see my campus like this. "those who want fatherland: come with Chávez..."
"I demand absolute loyalty to my leadership." "I am not me...I am a nation (un pueblo), I am not a person, I am the people"
And just now TV station Rctv (available on cable only) has been taken off the air once more. Miguel Ángel Martínez, PSOE politician and vice-president of the European Parliament said some weeks ago that "the vision people have in the European Union about the process taking place in Venezuela is not real" and "the idea about a monopoly on information [in Venezuela] does not correspond with reality" (here in Spanish). I have decided to send him a link to this post. 1) I would like to know from Mr Martínez if he is aware of the fact that less than 30% of Venezuelans can watch government-critical TV channels in Venezuela: those in the capital, those like Mr Martínez who stay at a posh hotel room on a diplomatic visit, those in Valencia or those who have cable TV (a minority in Venezuela, which is not Europe). 2) I want to know if Mr Martínez can tell us whether the Venezuelan opposition can speak out freely in state TV channels or if those state channels are to be used only by the government for its propaganda all the time. 3) I would like him to tell us if he is aware of how many hours a week TV and radio stations are forced to broadcast the president's speeches, among them those full of very vulgar insults against the opposition (just one of many examples here). 4) Does Mr Martínez know how many Venezuelans read newspapers and what the circulation of regime-critical newspapers is? 5) Does he know that Venezuela's president does not accept to have an open debate with anyone from the opposition, not even in election time, and that no critical journalist can even get close to him? 6) Last but not least, I want Mr Martínez to say something about the video above. Perhaps "No comments, those are internal matters"? I will let you know what he answers. Tomorrow once again we celebrate and commemorate the end of our latest old style directorship, the one of Perez Jimenez. Unfortunately, once again we need to hit the streets in protest as we are now under a new style of dictatorship perhaps but a dictatorship nevertheless. Or what else can we call a regime where the president decides to expropriate a supermarket chain and under its order a legislative parliament votes the necessary law within 4 working days? Caracas tomorrow will hold two marches. In one public employees will be ferried, forced to wear red and attend least they are fired come Monday because their name is missing from some check point roll during the forced march. In the other march people will join freely and they will be allowed to speak about anything they want, from commemorating of 1958 to protesting the electricity shortages and the corruption behind them. I cannot underline how important it is that whomever can assist, ASSITS! Neither Miguel or myself will be able to attend. I am still too weak to drive the five hours it takes to go to Caracas, never mind the 3 hours standing up such activity would demand from me. And Miguel cannot go for personal family reasons that will tie him up until Sunday. Thus we can only propose that readers of our blogs send us pictures and tweets and we will try to post them as we can, telling the story as it develops. Please, if you send a picture, make sure it is telling, of general interest and with indication of time and place. And if you live overseas but have relatives that are going, tell them to send you pictures and comments to resend this way. I updated the maps according to the official sources as seen here (electoral districts). The gerrymandering is worse than I thought in some regions. In others, like Miranda, things don't change much. As most opposition leaders and the national media are concentrated in Miranda and they think only on what they see, little interest will be spent to the rest of Venezuela. I used the votes of the 2008 elections for governor that the government has on its site. Salas Feo (opposition) was the candidate for the opposition and Mario Silva (regime) for the regime. Same amount of votes for each. That is gerrymandering and that is what the Venezuelan regime is doing. I suppose the Spanish government does not want to say anything about it...too many businesses are in peril. What is the vice-president of the European Parliament and PSOE politician saying now? Below you have the votes for the 2008 election of governor in my region. Ps. thanks to the people of Súmate (news in Spanish) and Esdata for providing such valuable data. The first poll using the blogger feature now closed automatically after 6 days with 189 answers. IT was for fun and there is no need for significant commenting. We must still note that the faith and trust in governmental numbers is so low that the winning option was the fudging of data one (the last one). The other noticeable thing is that for a blog that has been repeatedly excoriated by the PSF world, assuming that reading it was a mark of intellectual weakness and what not, there are 10% of replies for the first option, the pro Chavez one. Must we assume that 10% of the readers are closeted chavistas? Or just some readers making fun of the poll? At any rate, I promise you not to make this polling gadget a frequent figure, and to keep the final results at the bottom of the blog after a couple of days of the poll completion. Unless polls start making the page to long to download. 1) The role of the US taking advantage of the Haiti tragedy is disgusting and an aberration. 2) They have taken control of the airport and the presidential palace! What possesses Chavez, and Ortega and even Evo, all chiming on clue, to attack the gigantic and generous effort of the US (even with some occasional missteps)? Considering that the US has already has Puerto Rico and Guantanamo, friendly relations with Panama, Mexico and Dominican Republic, it is more than enough to ensure US security in the region at a much lesser cost than taking over Haiti as a colony. The thing here is that the professed hatred of the US is a self feeding psychological problem, inducing the practitioners into dream like trances where they get to make up things. It is also called delirium, some times of the tremens variety depending on what they accompany it with. I , for one, have rarely be so embarrassed by Chavez words than with this anti US rant. Almost as if Chavez would like to see looting and violence run free in Haiti to blame it on, who else?, the US. Chavez and his acolytes are indeed evil, worthy recipients of the worst voodoo curses we could come up with. I thought for a second about using a more attractive title, but there is no point in doing that. What the pro-government National Electoral Council (CNE) did now in Venezuela is the cheapest gerrymandering you can conceive. 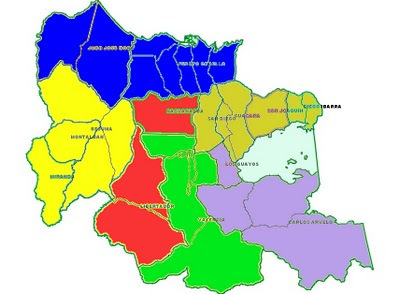 Last year the National Assembly passed a law allowing the restructuring of electoral districts at almost any time. The opposition demanded changes to be made as soon as possible. The CNE promised months ago to announce the electoral districts n December. 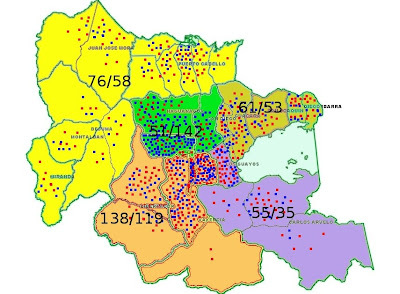 At the very last working day they announced just the electoral districts for states where the regime had a very clear majority in every electoral district: no change. They did not announce the districts for the most densely states, where the opposition is concentrated. A couple of days ago they did so. It was gerrymandering big time, as we thought. The only non-chavista member of the council, Vicente Díaz, denounced the whole process. Tibisay Lucena, the head of the institution, countered that "those are political argumentations...we here are isolated from [political] tendencies". She added they used geographical, cultural and idiosyncratic criteria". The chuzpah. Lucena is the same governmental functionary who went to Mali to promote the SmartMatic voting machines used by the Venezuela government, the same machines that do not produce the right paper trail, in the same system she claims to be "the best on Earth" even if it shows inconsistencies, even if partial results just appear many hours after the election took place and full results never come. In other countries where elections are carried out manually, as in Brazil, Chile, Norway, Sweden andNetherlands, results come very fast and without major. After some days you have all the results, unlike in Venezuela with its"the best system on Earth. Here you have an example of what they did in one of those densely populated regions. Carabobo is my region. This is just one of the states where they did that. The electoral districts before looked like below. A colour corresponds to an electoral district. 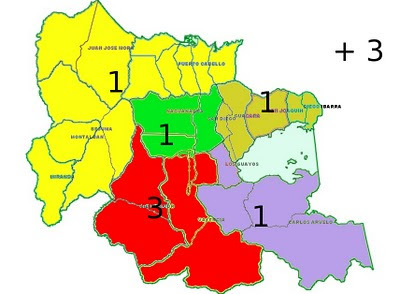 Electoral districts were made out of one or more municipalities. Green: the Northernmost half of Valencia are very opposition-minded. The Southern part of urban Valencia is rather pro-government, even if the opposition has about 45% of support there, all in all against the regime. Brownish: San Diego is a middle-middle-class municipality (not posh) that is very much anti-regime. Guacara is rather pro-government, although the governmental support is not very strong. Blue: Puerto Cabello as a municipality is still rather pro-government, but the city proper is not and support for the opposition had been increasing there. Yellow: rural area with regime-majority, but where the opposition was likely to gain support in Bejuma and perhaps Miranda. Libertador is one of the poorest areas and it is so dangerous we have few witnesses there. I have helped the opposition in that area and I have to tell you: it is scary to be defending votes there when it starts to get dark. Violet: this is made of Los Guayos, a former poor village that is now a big poor town full of slums (I know the area well, some relatives live there) and Carlos Arvelo, a rural region where the regime has clear control. 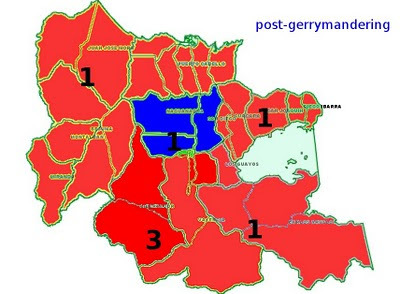 The winning party in each electoral district takes all the deputies assigned to that district. First of all: the government reduced chances of the opposition getting representatives for Puerto Cabello by merging it with the rural areas to the West and Southwest of the state. Then they "idiosyncratically" divided Valencia and reduced the effect of the growing opposition in the South by merging it with Libertador (which has just about 60% of the population of parish Miguel Pena, but is very red, so Miguel P.'s growing opposition gets neutralized). San Diego, which is separated by a mountain from Valencia municipality (see picture in previous post, it is part of that mountain range) and by quite some motorways and just grass Northwest and Southwest, is now "idiosyncratically" joined to the Northern Valencia-Naguanagua region. Guacara's growing opposition is now diluted. With this gerrymandering alone (thus, without other "optimizations") they would get 6 out of 7 nominal deputies when before they would get 4 out of 6. About 54% of the population voted against the government's referendum this year. Similar numbers went to the opposition last year. So: they will get if things remain as 54% of the population would get now just 1 of the nominal deputies and 46% will get 6. I will later go into more detail on this. Lucena and her colleagues really must be feeling very sure that this regime will last as long as it suits them. Now Hugo of Sabaneta again asked the opposition to call for a referendum even if the opposition has not asked for it now. He also said the so-called "Bolivarian revolution" is here to stay until year 3485? Where did I read something like that before? For those who can read some Portuguese do not miss this trashing of Weisbrot in Brazil. Hat tip Milonga. Scott Brown versus Obama. Really? Allow me to indulge in a non-Venezuelan (almost!) post. I have written often to my US detractors, from either side, that one of the things I admired the most about the U.S. political system was its ability at some point to correct its excesses, to find ways to return to more centered positions when a political group loses its ways and purpose. Even though a Liberal I did not lose much sleep when Bush was "elected" in Florida thinking that he would be a single term president. But 9/11 happened. The correction I expected as early as Bush first mid term elections was delayed until 2006. History and politics work these ways, but in the US the pendulum so far has always come back. Now the People's Republic of Massachusetts has handed the seat of Ted Kennedy to a Republican! Goodness gracious! Before I go further let me remind folks that I wrote an eulogy for Ted Kennedy, one of my favorite politicians. And yet I must say that I am sort of pleased by the result of last night election of Scott Brown, a rather handsome politician to a rather gray Senate, a "moderate" Republican that might end up bringing more trouble than joy to a GOP bent on refusing gay rights, abortion needs and such unavoidable XXI century social rights. After all he needs to get reelected and the results of this vote are far, very far from guaranteeing him a reelection in three years. If the coloring change of the image above is dramatic, the real results are clear though: if you look at the numbers above you will see that Brown improved only slightly over McCain. Thus his victory is due to Democrats staying home. Why? You can find many explanations from the Wall Street Journal to the New York Times (I have avoided reading Boston papers on purpose). But the one I will subscribe to is that the Democratic Congress elected a year ago behaved in an Imperial, Elite way, and that never works out. The Republican Congress elected in the second year of Clinton presidency, after yet another Health Care debacle, acted as arrogantly and allowed for a much easier reelection of Clinton than expected. The pendulum pattern exists. Quite possibly the Democrats might retain Congress this November, but their wings have been clipped last night and it is a good thing, at least for me. I lived one year in Waltham, a working class suburb of Boston, while doing research in a campus (it is the only light pink county in the map above, the only county Brown carried with less than 50%). Of course I looked for the results of Waltham. Obama carried it massively last year, with 15,276 votes (even though Waltham, if I remember well, was not very African American 20 years ago). This time Brown carries it with a mere 8,546 votes. I mean, the man carries it with barely half of the votes Obama got one year ago!!!! Can Nancy Pelosi of wealthy Marin County understand what happened in Waltham? I have my doubts. But if someone does not explain to her fast what this means, that blue collar and shop keeper democrats might return fast to the GOP, her days as Speaker are shortly numbered. This election was not about health care reform, but about how this one was carried. After all Massachusetts, and Waltham, do have already a state health care system. What has upset the Waltham voter and made it stay home is that what really matters for them, job security, economic growth, obscene bail outs, had to wait until Barack and Nancy pushed through an expensive package which was not a priority for them. Why did Obama misread so much the mood of the country and his own election implications? For reasons that always blind politicians who prefer to believe that people voted for them and their ideas rather than against the other side. A little bit like Chavez believing Venezuelans voted in 2006 for his socialism just to be disowned one year later in the referendum. People had reelected Chavez for his handouts, not for his ideas and that is why Chavez has been sinking slowly ever since. And yet I do not think that this marks an end to Obama, not at all. After all, after a post election learning curve I consider his foreign policy to be globally on the right track. At least for Latin America from his studied avoidance of Latin American viper's nest while managing to undo the Honduras entanglement satisfactorily. Maybe Obama did not feel as confident about Foreign Policy, he listened to his advisers, took experience into account and his prudence paid off. If this is the case then his approach to US policies was overconfident and he let himself be seduced by the left of the Democratic Congress who whispered sweet nothings to his ear. Thus the solution for Obama could be very simple: listen to ALL Democrats (and some Republicans). That way the damage can repaired enough that by November you will retain Congress. Maybe a weaker Congress but still a Democratic one (I do not see how Democrats can lose the Senate but I can see Nancy out of a job). PS: the problem viewed from here is that I do not see now how Obama will get the nerve to try to pass the much needed FTA with Colombia. And yet it is more needed than ever, something that Pelosi should wake up to, the easiest way for her to prove that she is more than just a knee jerk Liberal, that she is also a stateswoman.